Windom Place is finally getting its second Connecticut Avenue pedestrian crossing. Wasim Raja, the associate director of traffic engineering at the District Department of Transportation (DDOT) states in an email that the design is complete, and the crossing is on the construction list for this year. He says construction will most likely start in November. 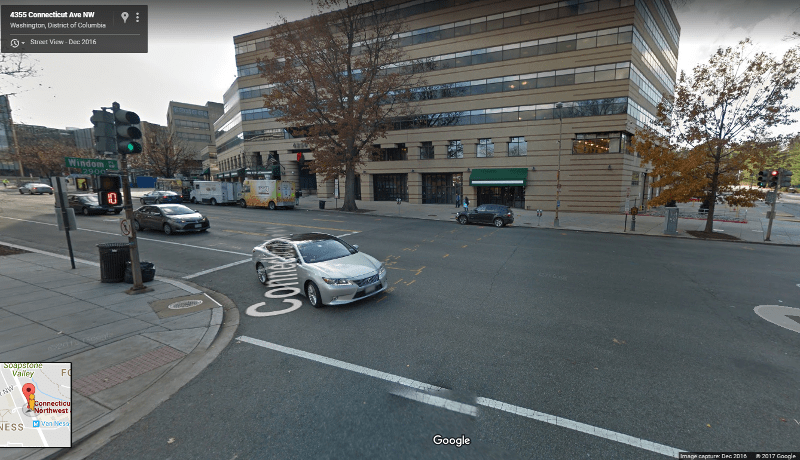 ANC 3F first requested a southern crosswalk at Windom Place on Connecticut Avenue at least 14 years ago. In 2014, the ANC passed another resolution, after digging up a January 2004 DDOT letter approving a crosswalk and pedestrian signals on this side of the Windom intersection. The most recent resolution of support was passed unanimously in September 2016. Van Ness Main Street brought this issue before the ANC because three performing groups were coming to the UDC Theater of the Arts for the 2016-2017 season due to renovations of their space at the Kennedy Center. This, it believed, would mean an increase in pedestrian traffic at this intersection since the theater is at the west end of Windom Place. 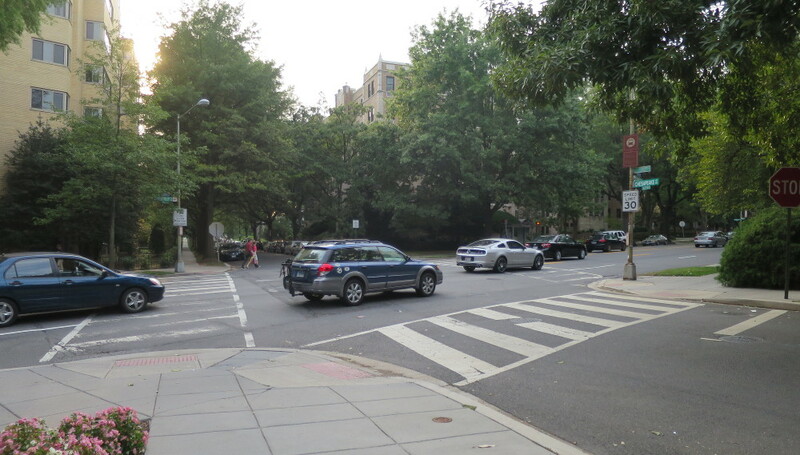 ANC 3F has for years requested a Connecticut Avenue pedestrian crossing at the south end of Connecticut and Windom Place. 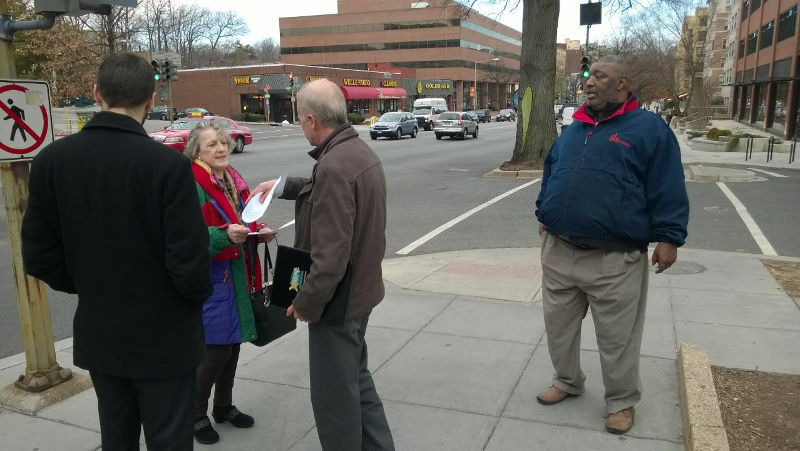 Former ANC commissioners Sally Gresham and Mary Beth Ray brought it up again as they toured local traffic trouble spots with DC officials in February. DDOT cannot yet provide word of progress on another hoped-for pedestrian improvement a few blocks to the north, at Chesapeake Street. Neighbors have asked for a pedestrian light to allow for safer access to bus stops and the Forest Hills Playground. Pedestrian counts done at this intersection were not high enough to meet the federal standards for a HAWK light, like the one at Ellicott Street. DDOT has been exploring other options. Pedestrians must cross six lanes of 30+ mph traffic at Connecticut and Chesapeake. This is great news. A huge thank you to the ANC, Marlene, and other pedestrian advocates who have continued to push for this badly needed crossing. Fingers crossed for a good solution at Chesapeake. It unsettles my nerves that my son crosses at Chesapeake every day on his way home from Wilson. As he points out, there is a lengthy gap in traffic because of the timing of lights to the north and south and the site lines are very good. However that only makes it somewhat safer than other corners, and we can’t all walk as quickly as a 16 year old. I think you should name the DDOT person in the picture also, so that they can receive some love too. You’re right! Pictured on the right is Derrick Hardy, Safe Routes to School coordinator; In the brown jacket is Kajaz Safarian of DDOT Transportation Services. The link in the caption names them and describes more of what they were doing that day in February. And we’d be remiss if we didn’t also thank DDOT’s Wasim Raja, George Branyan and Matthew Marcou for their efforts in improving neighborhood walkability.